This hotel served it's purpose - to have a good night sleep while traveling from St. Louis to Fort Lauderdale. We were not planning on staying in Orlando to see attractions. It was close to the turnpike and clean and gave us a good nights rest. Convienent location for getting on and off the turnpike and traveling farther south in Florida. Only able to get one queen bed instead of 2. No stopper in kitchen sink, no pots or pans for stove. The hotel was very nice, the employees were very helpful. The location was ok, not to far from all the major attractions. The housekeepers could do better with keeping the rooms supplied with enough supplies. The pool was very nice, always heated. The hotel could have a better smoking area. Overall I would stay again just because of the friendly staff and the homey feeling. The staff went above and beyond their job. The pool was always heated. The rooms could have been better refreshed, more often without extra charges. The pet-friendly Homestead Orlando South comprises 134 economically priced suites designed for the extended stay business traveler or families on vacation. The property is 12 miles from downtown Orlando and three miles from the Orange County Convention Center. Other area landmarks and attractions include numerous golf courses, Walt Disney World theme parks, Universal Studios and the CityWalk entertainment complex, SeaWorld, the Aquatica Water Park, Discovery Cove, the International Drive tourist strip, the Florida Citrus Bowl, Amway Arena, home of the Orlando Magic basketball team and shopping at the Prime Outlet Shopping Mall, Fashion Square Mall and the Florida Mall. All the studio suite rooms have a fully-equipped kitchen with a refrigerator, microwave oven, stovetop and dining and cooking utensils. Other amenities include a workspace with computer dataport, wireless Internet access for a one-time fee of $4.99, telephone with voicemail, television with cable news and movie channels, iron and ironing board and a hairdryer. This hotel has an outdoor heated swimming pool. Restaurants nearby include a Chilis, Carrabbas Italian Grill, Logans Steakhouse, Dennys and an Olive Garden. The reception office is open from 7am until 11pm and has information on the Orlando events and attractions area can assist with fax and copying needs. Housekeeping is limited but additional service can be provided for an additional fee. There is a guest laundry on-site. 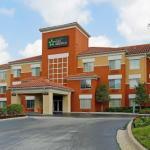 Visitors to Orlando who stayed at this Homestead hotel were delighted with the low prices, good location within a short drive to all the major attractions, and well equipped suites. Families who made use of the kitchens said it saved them money on restaurant bills enabling them to stay an extra day. Many understood the limited housekeeping and realized that was one reason for the less expensive room rates.